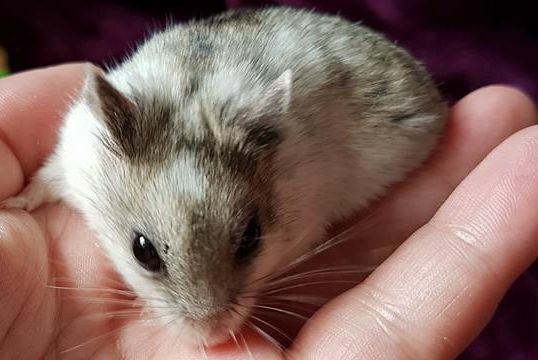 Arlo was the first male Chinese hamster here at the hamstery and is a long-standing member of our show team who recently received his first CoM at Andover. He's dad to the "Arlias" and is one of the most laid-back and cuddly hamsters here. Sakura came here from Vectis Hamstery and is a lovely girl, full of character but very picky when it comes to the boys. She is mum to "Sakura's Secrets" but hasn't had any successful pairings since. She's now retired from breeding and showing. Ash came here from Lilliput hamstery on the same day as Sakura and was our second pedigree male. He very much likes to be left to his own devices but does like the occasional cuddle. He's dad to "Sakura's Secrets" and is still used for stud but no longer attends shows. Jack-Jack is from the Arlia litter and is a special boy as he is a BEW carrier. His personality is very much like his dad, Arlo's and he's a big cuddle monster. He is a regular at shows and is a big part of my breeding plans. ​Holly is from the Acadane litter and was the only "true" Dominant Spot in the litter, unfortunately, she is too heavily marked around her back end so has retired from showing and is now a Willow Tree pet. Possum is also from the Acadane litter and is sister to Holly. There's a lot of uncertainty about her colour/coat pattern as she has a dorsal stripe and spotty ears but no other colour at all. She is mum to the Poaks which was a test mating to see what pattern the pups would be, 4 of which are just like Possum. Aspen came here from Lilliput hamstery in October 2016 and is another regular on the show team, usually placing 1st or 2nd Dominant Spot. He is a lovely chunky boy and father to my recent Aspzel litter. Oakley came here from Metallica Hams at the Wootton Bassett show 2016 and is our first non-home-bred pedigree Normal Chinese. He is dad to the Poak litter and is another chunky boy who is a regular on the show team. Heath is from the Sakura's Secrets litter and is a lovely chunky boy who showed lots of potential at shows. He is dad to the Little Heazel litter and, unfortunately, a falling out with Hazel during that pairing has put an end to his show career as he has some fur yet to grow back. He's still a lovely healthy cuddly boy who I hope will eventually completely heal and rejoin the show team. Hazel came here from Lilliput in April 2017 and is mum to the Little Heazel litter and the recent Aspzel litter. She's a lovely girl who I got in order to start a Normal line here at the hamstery. She's not the biggest of girls I've owned so shocked me when both of her litters contained 6 pups each! Bubo is a lovely chunky Golen boy who came here from Tickertyboo Hamsters in April 2017. I'd missed having a Syrian and it was a pleasure to bring him home. He's a lovely boy with bags of personality. I have no plans to breed from him at the moment but I may consider it in the future. Tulip is a special little Dom Spot who came to me from the Houten Expo in Holland via Vectis Hamstery in April 2017. She is a lovely girl who loves attention. Unfortunately, all attempts of pairing her up have failed. Ophia is from the Poak litter and is almost a carbon copy of her mum in terms of both looks and personality. Ophia remained here as a pet as she was the runt of the litter and took a lot of extra work to get her to thrive. As a result, I became too attached to her to rehome her! Wynter came over from Houten Expo back in November 2017 and joined the hamstery with her sister Juniper in the December. I plan to show both of them and to use them in future breeding plans. I am hoping that one or both of them carry the BEW gene..
Pixel is from the Aspzel litter and was the pup I chose to keep to further my breeding lines and to show as well. She's incredibly sweet-natured and looks just like her dad Aspen so I'm hoping she can mirror his success at shows in the future. Heimdal also came here from Oblivion Hamstery at the same time as Frey and has, again, always done well at shows. He's now retired from showing as he is over 2 years old. Chester is from the Poak litter and is a lovely chunky lad. He is the first hamster that I have bred to receive a CoM and placed Reserve Best in Show at the same show. I hope he continues to do well on the show team and would love to use him in my breeding plans when he's retired from showing. Juniper came over from Houten Expo back in November 2017 and joined the hamstery with her sister Wynter in the December. I plan to show both of them and to use them in future breeding plans. I am hoping that one or both of them carry the BEW gene..
Chip is from the Aspzel litter and is a very special boy. When I did the initial head count of pups, I only counted 5 but the following day this little pup was found snuggled up to mum, unfortunately he has a missing back paw so is remaining here as a pet. He doesn't let his disability get in the way of being a feisty little character but he has an equally sweet personality and loves to cuddle.